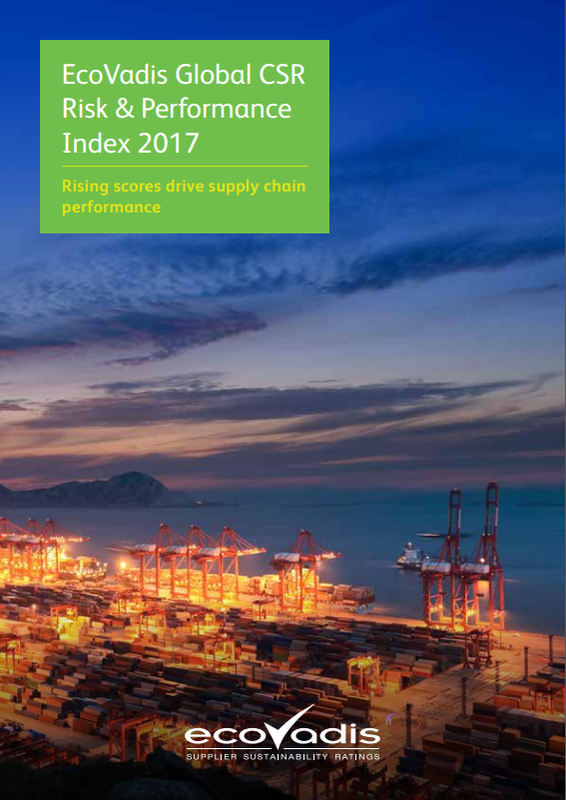 EcoVadis, the leading platform for environmental, social and ethical performance ratings for global supply chains, has published the first annual edition of its Global CSR Risk and Performance Index. The report illustrates the CSR performance of more than 20,400 companies evaluated by EcoVadis, based on Scorecard Ratings that analyzed nearly 800,000 data points across the calendar years 2015 and 2016. Small and Medium Food & Beverage companies, and Small and Medium Construction companies, tied for the highest percentage (61%) of low risk (scores above 45) companies, The large segment is led by Manufacturing Light industry (56%), followed by Finance, Legal, Consulting and Advertising industry (51%). The highest overall CSR score in 2016 went to Small and Medium Construction companies, which earned an average score of 47. In the Large category, the Financial, Legal, Consulting and Advertising market finished with the highest average score (46.2). CSR improvements: Large companies in the Manufacturing Light industry improved performance the most (19.2%) from 2015 to 2016. Construction showed the most improvement in the Small and Medium sized business segment (18.7%). Environmental performance: The Large Manufacturing Advanced segment led all groups in environmental performance with a score of 51.6. The Food and Beverage industry topped the Small and Medium sized segment with a 50.2 Environment score. Labor practices and human rights: Small and Medium sized companies in the Construction industry had the best score (50.3). In the large segment, the Finance, Legal, Consulting and Advertising industry scored the highest at 47.3. The Finance, Legal, Consulting and Advertising industry led all groups and sizes in the Fair Business Ethics segment with scores of 47.5 points for Large companies and 46.0 for Small and Medium companies. Sustainable procurement: Small and Medium Food and Beverage companies earned the top sustainable procurement score (41.9). Manufacturing Light took the top spot in the Large category (41.4). While the overall average score of both size groups (large and small/medium) was about 44, small and medium sized businesses are improving CSR scores at a faster rate than their large counterparts. Given that value chains are made up mostly of small and medium sized companies, the improvement rates represent a promising trend that will have a lasting supply chain impact. Geographically, EcoVadis’ research found a stark performance contrast between Europe, the Americas and AMEA. In 2016, the average score of Large companies across all segments in Europe was 49, compared to a 40.5 for Americas and 38.3 for AMEA. AMEA also had the highest percentage of companies that scored under 25 (13 percent in 2016), compared to the world average of 4 percent. 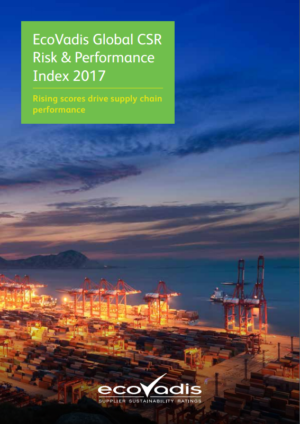 This year’s inaugural index also uncovered trends across major global industries related to, among others, the circular economy in supply chain, science-based targets to fight climate change, the relevance of cybersecurity for CSR and the nexus of corruption, human trafficking and modern slavery. To read the full EcoVadis CSR Risk and Performance Index, download the full 2017 report. Hey Buddy!, I found this information for you: "EcoVadis’ First Annual CSR Performance Index". Here is the website link: https://www.duurzaam-ondernemen.nl/ecovadis-first-annual-csr-performance-index/. Thank you.